Artists often do miniature studies of objects that might be included in a larger work and sometimes they produce a miniature to challenge themselves, or perhaps just for fun. "Enjoy the Roses" is both a challenge and a fun piece. 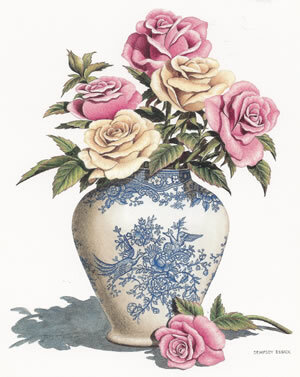 Roses are the most difficult of flowers to paint convincingly and Dempsey Essick is rightfully proud of his roses. On close examination, the discerning viewer will also appreciate the exceedingly fine decorative work and the eggshell white glaze on the delftware vase. Taken as a whole, it is like having a permanent bouquet of flowers to brighten every day. Enjoy the Roses! The complement to "Enjoy the Roses" is “Enjoy the Roses II”.